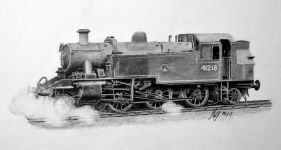 Steam Engine A pencil drawing of an Ivatt class steam engine, No. 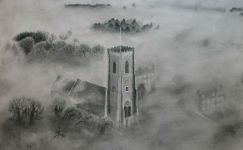 41218, circa 1948. 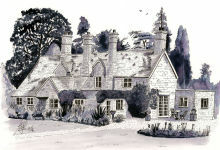 A Country Home A drawing of a country home in Northamptonshire using Ink with Ink washes. 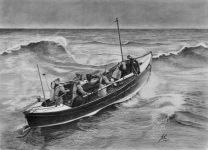 Flamborough Lifeboat 1971 A pencil drawing of the Flamborough Lifeboat in stormy seas in 1971. 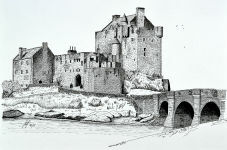 Eilean Donan Castle A pen and ink drawing of Eilean Donan Castle using scrimbling and hatching techniques. 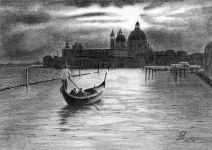 Sunset over Venice A contre-jour (into the light) drawing of the sun going down over Venice using pencil. 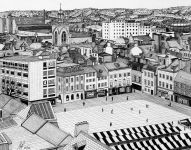 Northampton Market Square A pen drawing of a Northampton Market Square as viewed from the top of the Grosvenor Center car park.